Prior to the worldwide success of Dan Brown's bestseller The Da Vinci Code fewer than 20,000 people a year visited Rosslyn Chapel. Since then, the average has skyrocketed to more than 120,000 per year which is a good thing for both Scotland tourism and the Earl of Rosslyn. The additional revenue earned from entrance fees allows the St. Clair family (who have owned the chapel since 1446) to preserve it for future generations. The newer entrance includes a gift shop and tea room and is a nice juxtaposition with the much older chapel to the right. One step into the fenced church yard is like stepping back five centuries. The impressive detail of the stone mason's carvings is evident on the exterior of the building (close up below) and even more so inside. Unfortunately, visitors are not allowed to take photos inside, so you'll just have to visit the website or Google it for interior images. 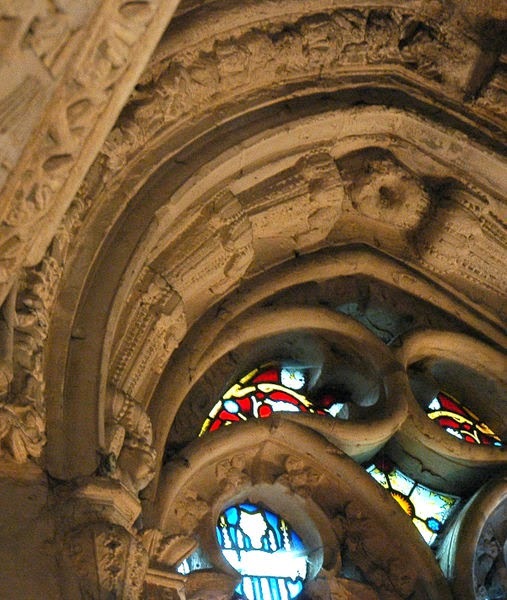 A number of carvings are repeated throughout the chapel, including stars, flowers, and images of the Green Man. 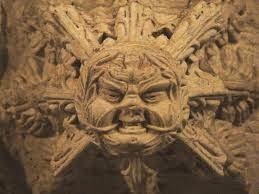 These Green Man faces are thought to be pagan in origin, although another theory is they represent the link of life with nature. The rose, of course, is everywhere. One of the most fascinating tidbits we learned while inside the Chapel was re the carvings above one of the interior windows that shows cobs of Indian corn. Now, given the chapel was build prior to Columbus' discovery of America in 1492, one wonders how this is possible. Research suggests William St. Clair, the man who commissioned construction of the chapel, visited what is now Westport, Massachusetts with some of his knights and spent a winter with the Micmac Indians. How amazing is that?! Back outside the view is still quite impressive. This is the opposite side of the chapel that also provides impressive views of the countryside. Entering the chapel it's easy to get overwhelmed, so imagine my surprise when opposite the guest book I spotted a sleeping black cat curled up on a pew. I gave him a pat and said hello, and then I focused on the wonders of the chapel itself. The only disappointment was the downstairs chapel. In the movie that's where all the documents were kept and Audrey Tautoo's character learned she is a descendant of the St. Clair family. That room was a movie set! The real crypt is a tomb like place that was used as a place of worship while the chapel was being built. On a positive note, however, we were witness to a rather spectacular sight...as well as sound. During the lecture in the chapel the leader was interrupted by a rather haunting voice that drifted up from the crypt and sounded very much like a medieval chant. It wasn't part of the 'atmosphere' because even they were surprised by the low, melodic song. Later, we went down to the crypt and discovered a young woman in white wearing a lace shawl. With her hands clutched tight to her chest in prayer she sang in front of the alter. Later, she broke down in tears. I have no idea what brought her to Rosslyn Chapel, but her faith was evident and she was from Russia. Now, back to William the Cat. Remember him? I petted him on the way in? Well, after we exited into the courtyard he wandered outside and sat on the bench beside John. Visitors can purchase William the Cat stuffed animals and other items with his image on it in the gift shop. The story is that as a kitten William wandered in the chapel and decided to stay. In my book that makes him one smart cat. Plus, he's a doppelganger for Doug our daughter and son-in-law's cat! From the chapel we walked past the cemetery to the pathway that leads to the old ruins of Rosslyn Castle. I was really excited when I spotted this particular spot as I recognized it as the place where Tom Hanks and Audrey Tautou shared a private moment near the end of the film. This residence was blocked off and marked private, and is obviously property the St. Clair family reserve for themselves. Visitors, however, can wander around the castle ruins which are just to the right of this building. Rosslyn Chapel is well worth the visit and we have Queen Victoria herself to thank for that. When she visited the chapel in 1842 it was without a roof and windows and in an overgrown state. Still, she recognized its importance and expressed the desire that it be 'preserved for the country'. Within 20 years it had a new roof thanks to the 3rd Earl of Rosslyn and once again became usable and a place for Sunday services.